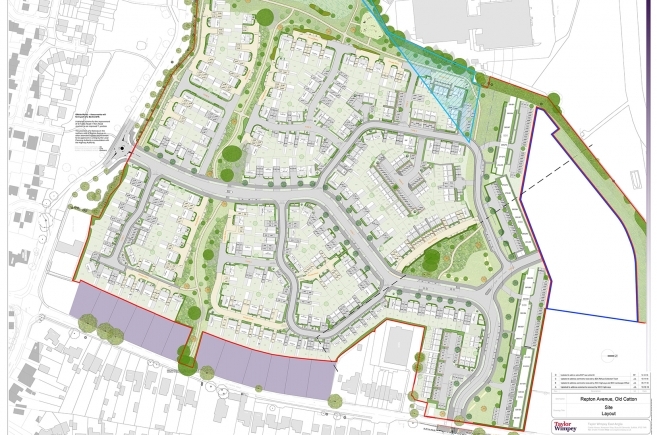 The site evolved through the planning process whilst we worked closely with the client and the Local Authority to embrace the site analysis, Local and National adopted planning policy and guidance, along with design principles for the development. The development proposes a mix of 2, 3, 4 and 5 bedroom houses, typically being 2 or 2½ storey in height, they are positioned to create a neighbourhood with its own distinctive identity, having a semi-rural character and providing an attractive sense of place. The continuous 3 storey alignment of apartments are positioned parallel to the northern boundary, to mitigate the noise of aircraft from the airport beyond, creating a strong perimeter to the development. The flat blocks are 3 storey in height and designed for habitable rooms orientated into the development, away from the noise source. The layout provides for an orbital link road to pass through the development, connecting St. Faiths Road at the site’s north-east corner to Repton Avenue at its south. Buildings here are to be set back from the road with landscaped frontages. The incorporation of generous well landscaped areas of public open space becomes a feature of the scheme. A linear park bisects the development, running from St. Faiths Road, west, to an area of public open space separating the residential development from the industrial estate. The linear park follows the line of an old field boundary and therefore allows the existing trees that originally marked it to be retained.